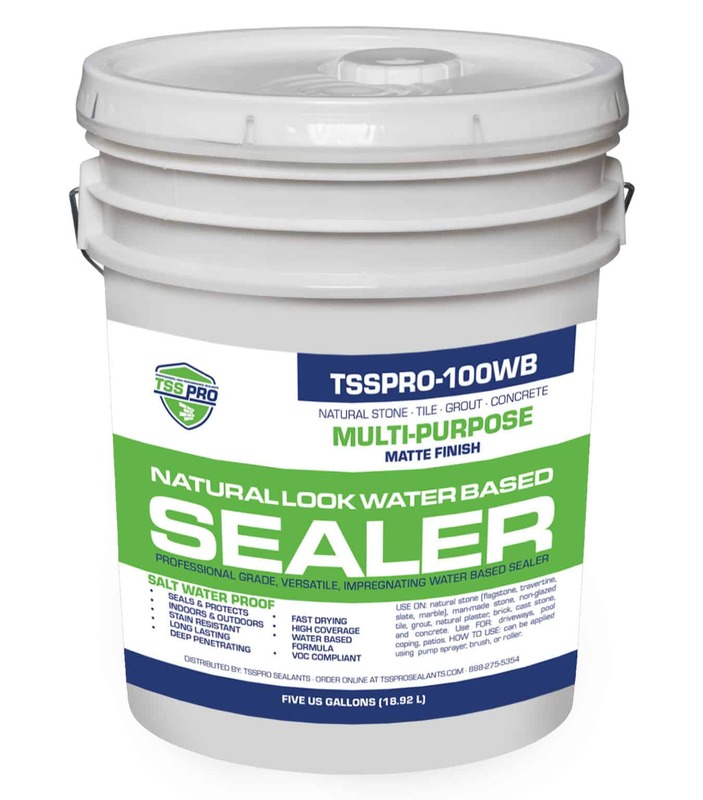 TSS100 is an industry tested, quality sealant that protects against salt water erosion and staining. It is a user friendly, solvent based silicon polymer that infiltrates deep into the surface, protecting natural stone, grout, concrete and masonry surfaces. TSS100 comes ready to use, with a fast curing process that will leave you with a transparent barrier that won’t yellow over time. Once applied, TSS100 forms a molecular connection with the surface material, forming a clear, powerful, water resistant bond which will act as a lasting barrier against water, pool chemicals, basic acid washing, salts, and other minerals found in water. TSS Pro-100WB is a water based natural stone sealant that also works well on natural plaster, unglazed tile and grout, brick and man-made stone and more. This blend of sealant is an ideal alternative for people who live in VOC compliant states. The deep penetrating sealant goes on quickly and can be applied using a brush, roller, or sprayer. TSS Pro-100WB is a water based sealant, blocking out harmful contaminants but allowing the stone to breathe. TSS Pro-100WB uses nano technology to get deep into every crevice and dries quickly in about an hour, and is ideal for protecting against saltwater erosion and water staining. This particular sealant leaves a natural-looking finish, allowing the stone or other material to show its true color. TSS Pro-100WB is a long-lasting formula that will give keep your coping, patio, deck, or driveway looking like new for years. To sweeten the deal, this sealant also happens to be affordable. What Can You Seal With TSS Pro-100WB?